Interesting idea. Yes, it could work with some proper detailing. I would bury the first few feet in the ground to make sure the base is stable. Add plastic plaster mesh on both sides tied together through the wall. (Add lengths of baling twine after each course.) Use tubes instead of bags so it’s more integrated. Two strands 4-point barbed wire. Berming around the base is good where the stress is greatest. Hire expert pool plasterers at least on the outside. Stabilize the bags with lime or cement. Delete the stairs. Plumbing is relatively easy. Include a drain at the very bottom for cleaning/draining the cistern. Add a hatch on top for access so you can clean the inside. Build a simple tool shed, etc. to first develop your skills. Have the best worker supervisor/check every step to make sure there are no soft spots or other errors. Use a center pole to guide the construction. 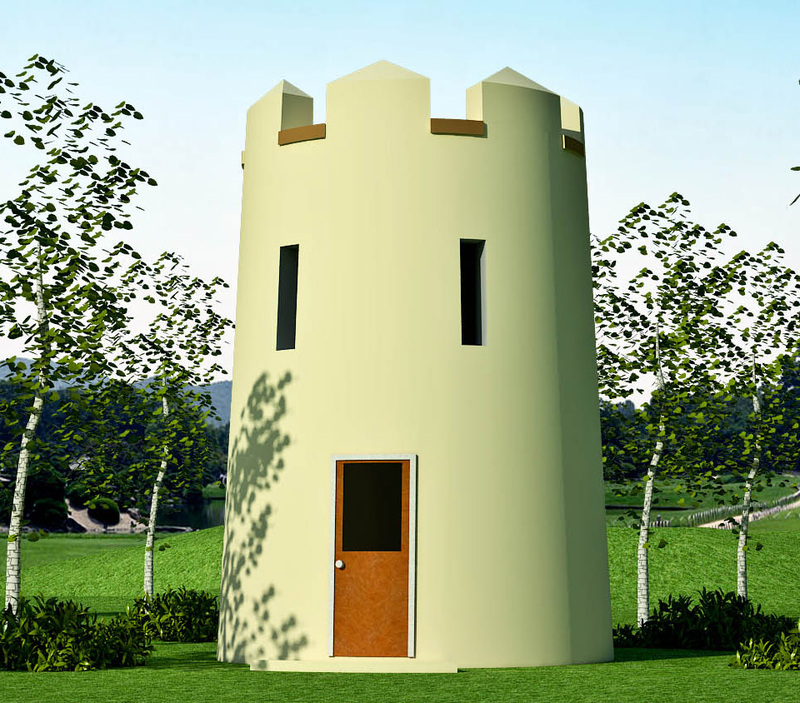 Since the two larger towers with the dome fort would already make great guest houses, I was thinking of making one of the observation towers a smokehouse and the other a sauna. If it was all built as planned, however, it would make a great theme B&B. 🙂 Come spend the night at an off-grid, earth friendly, working farm that looks like a castle! Yeah, the possibilities are endless. Lots of resorts and eco resorts build innovative structures to attract guests. I am interested in building the fortress tower. Where do I begin? Only the most popular plans are listed, so write Kelly if you don’t see what you want. We have thousands of pages of free building information on our various websites, including Earthbag Building.com and Natural Building Blog. We have free videos showing every step on YouTube, detailed Instructables at Instructables.com, etc. You can search our sites (slow and sometimes inefficient) or use a major search engine with a phrase such as earthbag videos Owen or something similar. Or you can buy my ebook and DVD to save time and effort. All the most important information is distilled for convenience. What about building a smaller version of this for the kids to play in? I need a small practice project before we build our house. Great idea. Sounds fun. Please document your project and share with others online. I have a blog that I document all my projects on so I will be sure to share it! I wish more people shared their projects, then we might not have such a hard time finding the information we need. What we have to go on right now is the dvd we got from you and a couple books really. Hence the practice project. Good on you for making this contribution. I look forward to following your blog. In addition to the DVD and earthbag ebook, we also have nearly 3,000 pages of free information at Earthbag Building.com and Natural Building Blog. We have read quite a bit on this site. Lors of good information. Thanks for helping us so much! Building below ground can work great. Just be careful because the home will be vulnerable to flooding, so build on high ground, use wide roof overhangs and slope the land away from your home. I have a new drawing of how to join roundhouses that will be in my upcoming house plan book. The book should be finished in about 3 weeks. Just watch our Natural Building Blog for the announcement. Or I’ll send this drawing as part of the package if you buy a house plan. Where we are building is pretty flat with a very slight downward slope towards the river that is 1 1/2 miles away.Since we are building domes we won’t have any roof over hangs. Do you thing that will be a problem? We planned on berming the house with another row of bags about 2 feet up and all the way around. (I hope that is the right term) And we are going to make the door way so that you have to go up two feet of steps to get in. Ware hoping this will eliminate the chance of flooding. Do you think those two things will do it. Since we can’t really do any of the 3 things that you suggested. Thank you so much for your quick response to our earlier question. This can work, although I don’t know all the details. So start small and experiment. Thank you. I have another question. We have dug a pit latrine that is 15 feet deep and 3 feet x 4 feet. We want to build a round earth-bag structure around it. We plan on using a domed building design. Do we need to be worried about the weight of the wall being too close to the hole and causing a cave in? 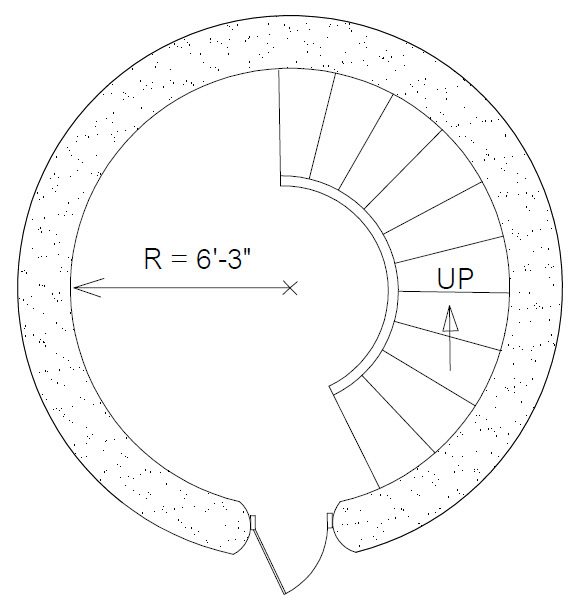 What diameter of dome would be safe? How far from the sides of the hole do the walls need to be in order to be safe? Yes, the latrine can cave in. Be careful. I can’t give you a definite answer because it largely depends on soil type. Some soils are more stable than others. Sandy soils are the least stable. One option is to build a lightweight structure over the hole so there’s less risk of collapse. 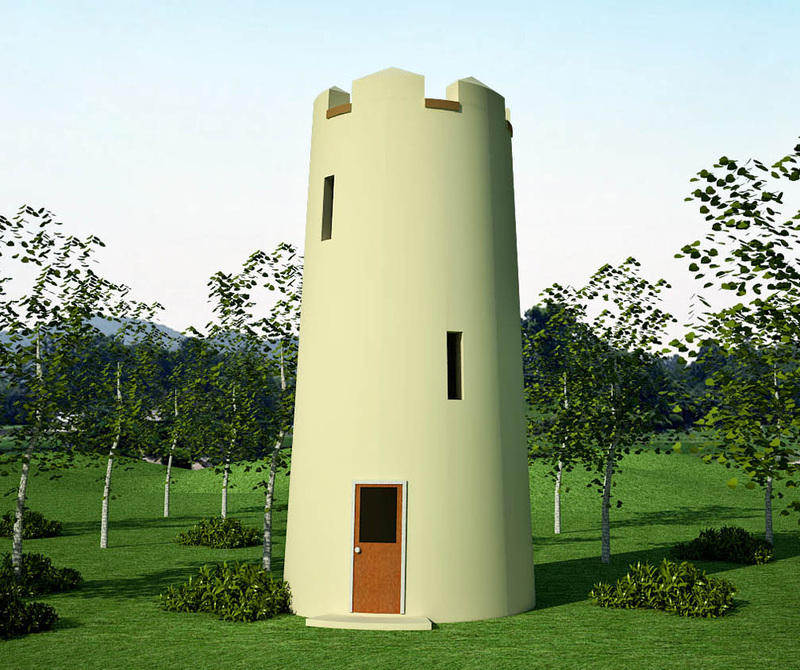 will this tower do well in Chiapas mexico where we have rain season. or should a roof be built on top the deck to protect from rain? If in doubt, add a roof or the walls will get black with mold. But first, look at other buildings in your area that are not protected with roofs (privacy walls, etc.) Are they turning black with mold? Maybe you have some rain but if the humidity is mostly low then the walls may not get moldy.